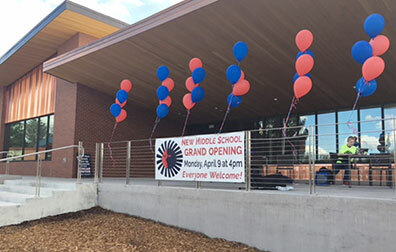 A ceremony was held on April 9, 2018, to dedicate Kent Denver School’s new middle school. 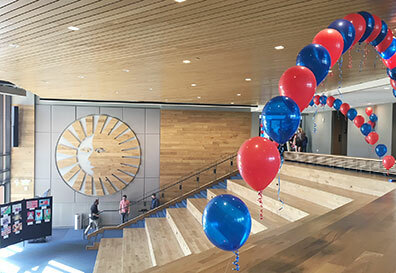 The new 35,000-square-foot facility nearly doubles the previously available instructional and community spaces for Kent Denver’s middle school students. At the heart of the building, the soaring John Kuntz Commons enables the entire middle school gather for assemblies, performances, and community-wide events, while dedicated grade-level common rooms in the building’s three wings allow students and teachers to come together in smaller groups. This multi-use space features three collaborative studios for tutoring and small group work, a faculty work area and lounge, and a wall of flexible doors to open to the space outdoors. The middle school’s Centennial Center serves as an innovative learning hub with multiple collaboration studios, an outdoor classroom, and more than 1,000 books. The LEED-registered facility (goal of Platinum certification) was designed with a focus on sustainability and respect for the environment. As the project’s mechanical engineer, RMH crafted a truly energy-efficient heating and cooling system featuring an evaporative rooftop unit with displacement ventilation, radiant floor heating, a condensing boiler, and a condensing hot water heater. With the future addition of photovoltaic panels, the facility could achieve net-zero energy, meaning the school would produce as much energy as it consumes. If the facility achieves LEED Platinum certification, it would be the third facility on campus to meet this sustainable design milestone.